Jennifer Harp-Douris, of Woodbine, creates custom jewelry pieces. 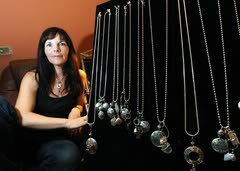 Jennifer Harp-Douris works on her the custom-metal jewelry she makes in her Woodbine home. A sample of the custom-metal jewelry made by Jennifer Harp-Douris. Jennifer Harp-Douris stamps words such as "peace" and "dream" onto silver teardrop pendants, and the pendants serve as her peace and her dream. The Petersburg resident attaches the silver pendants to necklaces and bracelets, adds gemstones and charms and then sells the jewelry online or ships the pieces to about a dozen area stores. She's produced this type of jewelry for a year and a half, ever since she envisioned it in her sleep. "It just came to me one night," she said. So she wrote ideas in what her husband calls her "crazy" book, a red diary overflowing with pen scribble and Post-It notes. The binding is worn. The bookmark nearly hugs the back cover. She already bought three more blank books to prepare for the inevitability she'll fill her first crazy book. Smart move - she still has a lot of sketches to draw and Ghandi quotes to transcribe. "Ghandi sayings go great on jewelry," she says. So one of her recent favorites has "Be the change you wish to see in the world" etched in silver. The letters are wavy and curly and missized. Amidst all of life's hardship and uncertainty, the letters are one thing she has control of. Rewind eight years. Harp-Douris owned a gift shop in Ocean City then, Scarlet Begonias. She was married with two young boys when her husband started acting strange and distant and inconsistent. One day he awoke with a pounding headache. He went to the hospital, and the doctors found he had fungal meningitis, hidden for months by steroids he was taking to treat Crohn's disease. Harp-Douris spent her days at the hospital supporting her husband. During the hospital visits she got bored reading books and magazines, so she started stringing beads together. Harp-Douris kept stringing beads together when her husband passed away in 2001. Jewelry gave her a chance to work from home and spend more time with her boys. "It was a really tough time, but I'm so thankful I was able to be there for my children," she said. A few years later Harp-Douris married her current husband, Steve. Things finally seemed to be settling down, until the doctors found a mass in her breast. Cancer. She underwent a double masectomy and the doctors began reconstructive surgery. And there was Harp-Douris, on the way home from the hospital, taking orders for her jewelry. "I was on morphine and kind of out of it but I answered the phone," she said. "It helped me take my mind off of things." Jewelry continues to help her take her mind off things. Harp-Douris enjoys the jewelry that carries words, things such as "peace" and "dream," because they allow people to consider what those words mean to them. And for Harp-Douris, peace and dream are exactly what she's found.